Exposing students to different cultures is important to their intellectual development, as well as creating a more accepting international environment at Jacksonville University. 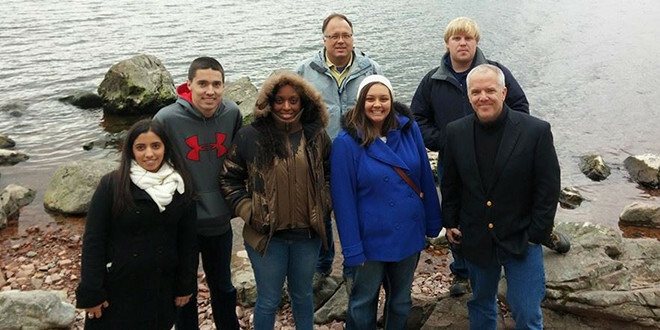 While most students were vacationing during their spring break, a group of students joined Dr. Doug Johansen, Assistant Professor of International Business, and Dr. John Shaw, Assistant Professor of Management, to explore Scotland. While visiting Scotland, JU students participated in the Inverness Innovation Festival in Inverness, United Kingdom. 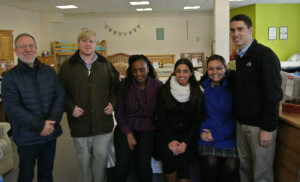 During this event, the students were able to learn about social entrepreneurism and its prevalence in the United Kingdom. Social entrepreneurism involves small-to mid-size companies that provide assistance to improve environmental or human well-being, rather than maximizing profits for their business. In addition to the Innovation Festival, the group visited various cultural sites, including like Loch Ness Castle, a ski resort, two businesses and the city of Glasgow. Also, the group toured the University of Highlands and Islands (UHI) latest expansion of its college campus. The new expansion will feature academic areas including Health and Beauty, Engineering, Chemistry, Construction and Forestry. The group toured with students from UHI and discovered differences between the European education system and the United States. The Davis College of Business has been focusing on the United Kingdom, specifically Scotland, to provide a unique opportunity to visit a progressive environment in Europe, without having to worry about language barriers. In 2013, JU created an agreement with City of Glasgow College and recently signed an exchange agreement with UHI to allow students to study in Scotland for a semester or longer. “By visiting Scotland, students were given an opportunity to see firsthand how employers everywhere value world-class knowledge, skills and abilities,” said Johansen. The group presented what they learned at One Spark April 7-12 in Jacksonville, as the ‘Global Business Imperative’ group in the education category. Through this presentation, the group presented why those who want to start a business or study business need to think globally. By experiencing international travel and how other cultures conduct and execute business plans, much can be learned about how cultures differ in the business realm. “The visit to Inverness illustrated the contrasts between entrepreneurship in Scotland and the U.S., in particular how social entrepreneurship is more accepted and perceived more positively,” Johansen said. UHI provides a unique opportunity for undergraduate and graduate students to experience attending a university in Europe. Representatives from UHI have visited campus three times within the past school year, working with faculty and administration in the Davis College of Business, College of Fine Arts and College of Arts and Sciences, to execute a complete exchange program targeting numerous academic areas. Academic areas in marine science, dance, theater and business have been the top target areas, based on reputation of the academic program.